How We Drained Our Energy Over Small Talk? Why I Am Not Interested in Small Talk? I had a great conversation with a friend who had an opposite view about small talk. Both of us have Undefined Throat. If you don’t know what Undefined Throat is; it means we have an inconsistent energy to communicate or to act. Sounds bad, isn’t it? Well, it is not bad. Undefined Throat people have the flexibility in communication and action. For example; Celine Dion is an Undefined Throat person and she is a great performer. One thing you need to know about Throat centre is, all our energies are going to channel out through the throat. For Undefined Throat like me, I would feel drained if I overuse my throat energy. Therefore, to conserve the energy, I speak when I need to and most of the conversation is educational. Now, is that boring? Maybe to some people. I used to have a friend who called me boring because I no longer entertain small talks. I’m a person who is picky about small talk because I feel that small talk drains my energy, especially I am an Undefined Throat person. I noticed the same patterns in human collective. What I see in many people is, they wasted too much of their energies on unnecessary small talks especially with people they don’t love. Every single time we talk, energy is used for that matter. By the time they need to get their act done, they have no energy to do so because all of it is wasted on small talk. If we to combine all the small talks in the world, it will be too many noises with only small gap for the Stillness. Do I Completely Avoid Small Talk? I love small talks, with people I love and when we have coffee together. I do small talks with my Chiropractor too. And I love to laugh. Any small talks that can make me laugh, I’m on it. I think it is lovely when we do it with people we love. I guess this is what Tribal all about. There is more to learn about our Throat centre; the source of sounds and door to all manifestation in this world. Everyone is different, and yet it takes same awareness to notice the right timing in communication and manifestation. These are my small talks for today; chocolate chips cookies dreams, uncut chicken dreams, a selfie in the kitchen and a cat on someone’s head. It is hilarious! And all that gives me some boost to write about this topic. Now I think it would be great to sit on that couch with a cup of coffee and a box of chocolate chips cookies as a reward for the post. Anyone… wanna join me? Photo taken at Bangsar Shopping Center. If you like my post and the photo-stories, you can Buy Me a Coffee by clicking the button above. It will be spent on educations fees and books. Thank you for supporting me on this journey. The Light Side of Obsession. When we talk about obsession, we will be drawn towards one side of perspective, which is the negative ones. The feeling is like addiction towards something or inability to control the compulsive desire. That’s probably how far we label the energy of obsession. Now I want you to step out from that perspective. Let’s see and understand Obsession at its finest seed. Let’s look at it when it is still raw. What is an obsession and how it helps us to look at the Micro Universe when our physical senses could only sense the Macro Universe? Obsession – The Magnifying Glass. Have you ever obsess about something or someone that you could not stop paying attention to the details of the object? Obsession, by its nature is here to give us space to focus on details. When we obsess about something, we start to see details in the obsession like shapes, movements, sounds and etc. Obsession is like the magnifying glass that brings the Micro Universe to the surface. Basically it would make our life feels richer. The Micro Universe is so subtle and often unrecognised until someone focuses on it. However, it requires a deep passion towards the object before one can focus. The raw energy of obsession is to help us focus, and expand our awareness on it. I believe everyone has the seed of obsession that waits for the right moment. If you haven’t taste obsession, the energy moves like waves. At times, the waves are in harmony. It can be gentle and tender, and it can be intense and raging. It pushes you to the peak and then pulls you to the valley of the waves. That will give you focus on the micro and then back to the macro Universe, so to speak. It will enhance your emotions to the deepest source and then pull you back out to (so-called) reality. How to Ride Your Obsession in the Healthy Way? Although obsession mostly relates to negativity, if you experience the energy without labelling the good and bad and without reacting unconsciously towards it, you can ride the waves into details of creations without harming yourself and others. If you are aware that obsession is just an energy you need to focus, you could enjoy the beauty of everything without trying to taint it with addiction or attachment. The keywords here is to be conscious when you ride the obsession. Any sort of attachment can lead to addiction towards certain emotions and anxiety. When you pulled to focus on the things that excite you and then you find it hard to get out, then that could be the sign of addiction. Any obsession that harm your Soul and/or others, is unhealthy. The common obsession that you can experience is when you first fall in love or when you found something that triggers the deepest love in you. This is where you start to pay attention and give in to every energy that can uplift your ability to focus. The recent collective obsession (healthy ones) is the Colouring Books for Adult, which is used to reduce stress and increase the capacity to focus. Another example of obsession is Pokemon Go. Although it is just a game, it has increased the potential for addiction rather than increase the ability to focus on the Micro Universe. This is where many of us find it hard to get out from the obsession until the energy subsides on its own. Use the energy of Obsession to help you see the details of Life. No matter how fun or excited you get with the obsession, practice moderation. Ride the waves and then get back to the shore so you don’t lose yourself in the sea of Obsession. Why Letting Go With Fire Is Not A Good Idea? You just broke up with your lover and you have so much anger, fear, frustration and hatred in you. These emotions soon become non-beneficial feelings and situations to you. All you have now is the urge to take the burden away from you. Then you started to grab a piece of paper and write down your feelings. Once you have finished it, you started to burn the piece of paper. Do you do this? Are you familiar with the tips? I’ve seen this act many times in my life. I thought it was a great steps but I was wrong. Here I am about to tell you that the act of burning it is not a good idea to get rid things and emotions. Here are the reasons why. Do not burn the non-beneficial feelings or situations with fire. It will only get worst. When you write the feelings and situations you don’t like on paper, you have transfer the energy onto the paper through your powerful words. 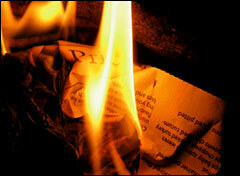 When you burn it, the fire increase heat on the words you wrote on the paper. That is why whoever burn their emotions through this process, didn’t really heal from the pain. Instead, they get more heat from it. 2. Fire relate to anger. How do you feel when you get close to fire? Do you feel uncomfortable burning by the heat? How do you feel when you are standing closer to someone who is angry? Do you feel intensity and uncomfortable? Fire promotes intensity. The words you just burned have increased its intensity and turning into uncomfortable sensation of yours. It also means, if you burning your anger, you only gets more anger later on. 3. Energy Can’t Be Destroyed. Since energy can’t be destroyed, whatever feelings or situations that you try to burn are still has its energy only in different form. The non-beneficial feelings and situations you thought has been destroyed are in fact still linger in your life. The right way to get rid things is to transmute the energy you no longer need in harmony ways. Instead of burn it, try burying it. The act of bury means death and to our subconscious mind, it means ‘no longer serve us (the living)’. In fact, the energy you put onto the paper and the paper itself will be transmuted naturally by the nature. And here’s the important part, it is alright if you need unleash all the non-beneficial feelings on the paper but close your case with gratitude and thank the feelings or situations for their services. This way, you are not just sending it off with anger but you choose to end it with LOVE. The energy of Love (the most powerful energy in the Universe) that you give will heal the energy of anger, fear, frustration or hatred that you released earlier. In the end, it all becomes a HEALING for your emotions. If bury is too much for you, simply throw it away outside your house for recycle process. And the key words; send it off with LOVE. You can also get rid of non-beneficial energies with Full Moon Ritual. Check it out here.